“There are so many standout companies and leaders in this community and the nominations alone are extremely humbling,” said Jones. Jones attained a course credit through the completion of the LaunchPad course in the 2014 winter term, and he continued to develop his startup throughout the spring term as part of the LaunchPad program along with his business partner, a University of Waterloo student. Since beginning to test their company idea in January, they built their company’s software system, made their first sale in April, worked full-time over the summer, and have continued their business while studying full-time. 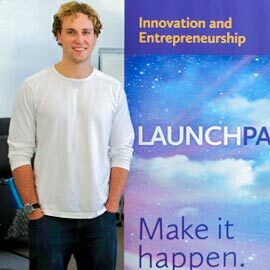 "LaunchPad has been fundamental in everything we’ve done, in every which way," said Jones. "There’s no possible way that we would have validated what we are today without the teaching and methodologies of LaunchPad." Moving forward, Jones says he will continue to utilize the LaunchPad methodology, which he credits for getting him this far, and will grow Local Line to become a staple of the food system in Waterloo.